Slippery elm is a medium-sized tree, up to 80 feet tall, and has either a single or multiple trunks. Its silhouette is not as graceful as that of the American elm (Ulmus americana), but it is still an attractive tree, with a branching trunk and wide, flat crown. 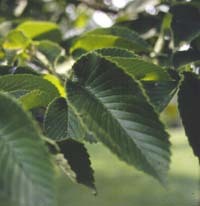 Like American elm, slippery elm is a rapidly growing tree, tolerant of competition. It is less able to withstand inundation than American elm, and is found less frequently in flood prone areas. It occurs both in wet, bottomland woods and rocky, upland forests. Slippery or red elm is named for its inner bark, which is moist and sticky (and consequently "slippery") and red. It is distinguishable from other elms by its red, hairy buds and its rough, hairy twigs. 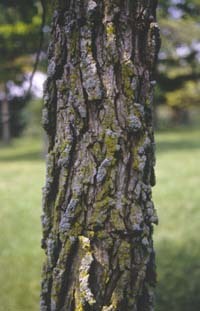 Slippery elm is less susceptible to Dutch Elm Disease than American elm, but just as susceptible to elm phloem necrosis, another devastating disease that affects the nutrient conducting tissues of the tree. The bark is deeply furrowed and brownish red. The leaves are alternate and simple, pointed at the tip and doubly toothed. They are from 4 to 7 inches long and the sand papery texture of the upper surface and asymmetrical base distinguish slippery elm from other elms in the state. The lower surface of the leaves can be either smooth or hairy. The flowers appear in late winter or early spring as drooping clusters and are small, green, and hairy. The fruits are similar to those of American elm. They are small, flat, winged and circular. Slippery elm wood is heavy, durable, and close-grained. It is used for fence posts and farm implements. Native Americans used various parts of the tree for a wide range of medicines, and the ground inner bark was once used to prevent scurvy. The inner bark is still used in the preparation of some throat lozenges.